It’s the high season for trans-Atlantic flights, but for those in North America there are air deals to be had to Asia, the Caribbean and around the United States. There are resort discounts to be had too. Here’s a selection of nine of them, including cool deals from flash deal websites SniqueAway and Jetsetter. Most of these deal have to be booked before the end of June (if not sooner) but allow of stays throughout the summer. If you are longing to get away from the heat — or to find it — Spot Cool Stuff has a collection of awesome airfare discounts, holiday deals and high-value all-inclusive vacations. or — why not? — act on all three of those options. Most of these sales are good for the whole of July 2010 but all expire at some point. So act quickly if you see a deal that matches your travel desires. Every month Spot Cool Stuff selects travel bargains for our readers. Here’s our collection for May 2010. As ever, you can see our latest bargains by . . . Please note that all of the offers below are for a limited time. And with that, here’s to happy, high-value travel! November marks the start of the high season for many of the world’s warm weather destinations. Travel to places like Thailand, Turkey and the Caribbean starts to get expensive. Meanwhile, the ski season in Europe and North America prepares to get into high gear. Fortunately, there are good travel deals and discounts to be found. Here’s a selection of a few of our favorites. 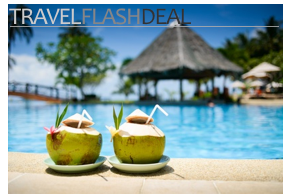 As always, you can stay updated on our latest travel deal posts by . . . Please note that most of the offers below are for a limited time. And with that, here’s to happy, high-value travel! October is an odd time for travel booking. It is low season for cruises (check out our review of luxury cruise lines currently offering discounts) and for Europe and for Southeast Asia. The northern hemisphere ski season hasn’t started yet and the Caribbean is at the tail end of hurricane season. But all this means there are more travel bargains for you. Fall is coming to the Northern hemisphere, spring to the Southern, and travel bargains abound. Here’s a selection of some September travel deals that caught our eye.